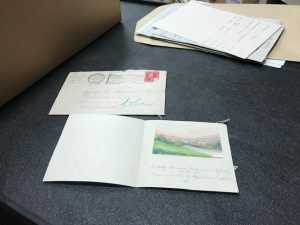 This month’s blog comes from one of our ‘Reading Readers’, Anna Strowe, who’s been looking at the archives of the publishing companies of George Bell & Sons and Macmillan. George Bell & Sons consists of correspondence, ledgers & miscellaneous records from 1813–1976. 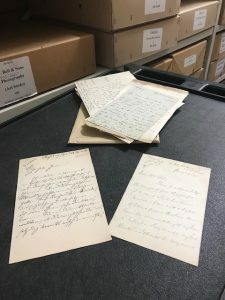 The Archive of Macmillan at the University of Reading is vast and mainly consists of around 60,000 incoming letters, covering the period 1875 to 1967 with material also held at the British Library. 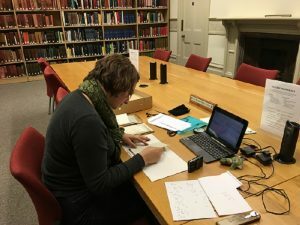 We asked Anna about her research and about some of her favourite things she had found within the collections. I’m working on translation in the archives of George Bell & Sons, covering items from 1890-1900. I started out initially just wanting to know what kind of materials there might be that would address issues of translation, and narrowed down pretty quickly to looking mostly at correspondence in and out. This is part of a larger project, where I’m also looking at Macmillan records in the same period. Within these materials, I’m particularly interested in a couple of things. First, I want to know very generally what kinds of conversations happen around the issue of publishing translations. Who is involved and what do they write about to each other? What do proposals look like? What do reviews look like? How do translators and texts get chosen? Unsurprisingly, a lot of conversation is about whether things will sell, and about pricing and payment, but there’s also a lot of conversation about other issues: why people think a particular book would do well in translation, how people know the translators they are recommending, what various readers think is good or bad about particular translations. I’m also interested in particular stories that come out of the archival materials. I’ve started to focus on one that involves a Dutch-born professor of English literature in Germany, his three-volume history of English literature and another volume of essays on Shakespeare, three publishers, seven translators (some just hopeful for more work! ), a particularly harsh book review, some miscommunication about what the actual problem is, the professor’s wife, and an infringement of international copyright law… That story plays out over the course of around 50 letters back and forth between these various people, and 21 letters that must have existed but that I haven’t found. I’m also interested in the stories of particular translators who come up in the documents repeatedly. I’m trying to find out more about these translators through both their letters and outside research; they can be a bit hard to track though! Just some of the letters Anna worked with. In the forefront – MS 1640/223/255 and MS 291/255. And then there are the random little things that you find: a rant from an outraged author who believes his work to be revolutionary, in which he suggests that they probably didn’t even read the manuscript, and offers as evidence the fact that they had misspelled his name in their reply (his signature in the previous letter was almost illegible! ); a hint that several of the translators whose names keep coming up in the archives actually knew each other, when one of them writes that she saw “Miss Whoever” at a dinner party the other evening. two sisters in New Jersey. They write to George Bell & Sons essentially just to thank them for having published so many lovely books that the sisters own, and include a tiny watercolour done by one sister. The picture is a little scene with a meadow and a river with a couple little houses and some birds, and hills in the background. It’s about 4 x 6.75 cm, and it’s been sewn to the card (which is also quite small- about 8 x 9 cm) with six little stitches in white embroidery floss, in the corners and top and bottom centre. It’s signed by the sister, Abigail Brown Tompkins, and titled “A Misty Summer Morning in New Jersey U.S.A.” I don’t really know anything about it or the sisters, and it’s not actually part of what I’m supposed to be working on, but it’s such a wonderful random gesture. I still have a huge amount of work to do though; my time in the archive was really just collecting images of all of these documents, so I’m only just starting to read through them in more detail and get a better sense of what’s there. I’m sure I’ll find many more interesting and surprising things. To find out more about the above collections get in touch via email at specialcollections@reading.ac.uk or visit our website https://www.reading.ac.uk/special-collections/. Follow us on twitter @UniRdg_SpecColl and @unirdg_collections on Instagram for updates on services, events and collections.